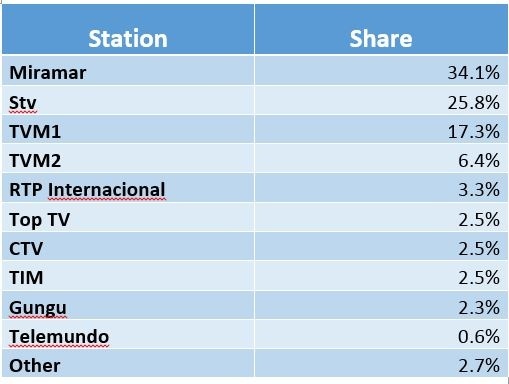 We are pleased to provide you with a Media Measurement report with audience statistics on Top TV Stations and Top Radio Stations for Quarter 3 2016 in Mozambique, where the GeoPoll Media Measurement service is currently available . The graph above shows that Rm Antena Nac. leads in ratings at the national level throughout the day with its highest rating being between 6-8AM at an average of 3.81. Miramar achieves the second rating nationally between 8AM-6PM. There is a stiff competition in ratings amongst the other stations. Rm Antena Nac. Achieves the top spot with an average of 13.0% of all listeners, followed by Miramar with an average of 7.3%. Rm Prov. Nampula captured 6.1% average share with a slight advantage over Rm Prov. Manica which achieved an average share of 5.8%. 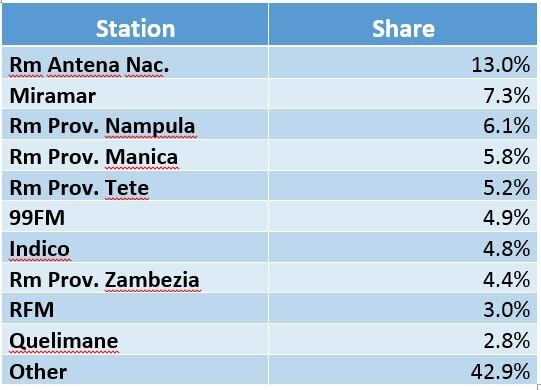 The high share % for other stations outside the top 10 indicates the large number of radio stations in Mozambique, which broadcast across the country at a regional level. Miramar has the highest rating nationally during peak hours with its highest rating average of 13.23 between 9PM-10PM. STV takes the second spot followed by TVM1 in third consistently. TVM2 gets the fourth rating nationally with a stiff competition amongst the other stations. Miramar has the highest share with an average of 34.1% followed by STV with an average of 25.8%. TVM1 achieves the third highest share with an average of 17.3% followed by TVM2 with an average of 6.4%. Use the below form to contact us, to subscribe to GeoPoll Media Measurement, request a product demonstration, or be notified when GeoPoll Media Measurement launches in other countries. Please be as detailed as possible about your media measurement needs so we can respond promptly.